The recently resurrected line of Star Wars ARTFX Statues (bringing the heroes and villains of the Star Wars universe to life in dynamic 1/7th scale) continues with one of the most popular characters from the prequel films. A leader of clone troopers and friend to Obi-Wan Kenobi until Order 66, here comes EPISODE III: REVENGE OF THE SITH COMMANDER CODY LIGHT UP VERSION! 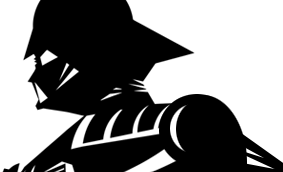 Designated unit 2224, the clone trooper who would one day play such a prominent role in history excelled in an advanced training program and was able to give himself a name: Cody. He quickly rose through the ranks, eventually leading the orange-accented 212th Attack Battalion alongside Jedi Master Obi-Wan Kenobi. His most fateful battle would take place on Utapau, where the Clone Commander would turn his sights from General Grievous to Kenobi himself! Commander Cody is instantly recognizable even among countless clone troopers by his unique armor modifications and color scheme. His complex helmet and shoulder-mounted antenna feed him up to the minute battle data, while the orange and white proudly pronounce his membership in the 212th. Paying homage to Cody’s switch in allegiance, his ARTFX Statue comes with two unique display modes. The first depicts the commander before Order 66, standing triumphant on the field of battle with his blaster at the ready. Cody scans the scene before him looking for any final opponents while dangling from his left hand are the remains of the last one: the severed head of a battle droid! If you prefer the commander working for the dark side, swap out parts to portray him in the final moment before turning on Obi-Wan. This Cody looks down at a hologram of Emperor Palpatine that glows with a bright LED light! He even wears the Jedi’s lightsaber on his belt as the character did in that specific scene. Commander Cody stands 11 ½ inches tall (1/7th scale) on an exclusive Utapau georama base. The battlefield at his feet is littered with debris and battle damage, not to mention battle droids blasted to scrap! 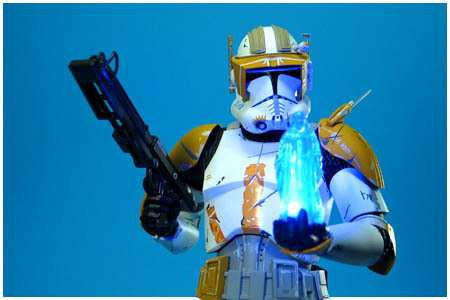 Kotobukiya's Revenge Of The Sith Commander Cody Light Up Version ARTFX statue began shipping in July 2011.